In the Golden Hour, when the sun slips below the horizon and a golden glow is left to fill the sky, magical moments seem possible. This was one such moment as I stood in the warm evening air, admiring the architecture of Oia, Santorini. I’d dreamt of seeing and photographing the windmills of Greece all my life, but three short years earlier I was toiling away in an office building in Brooklyn, making someone else’s dreams come true. 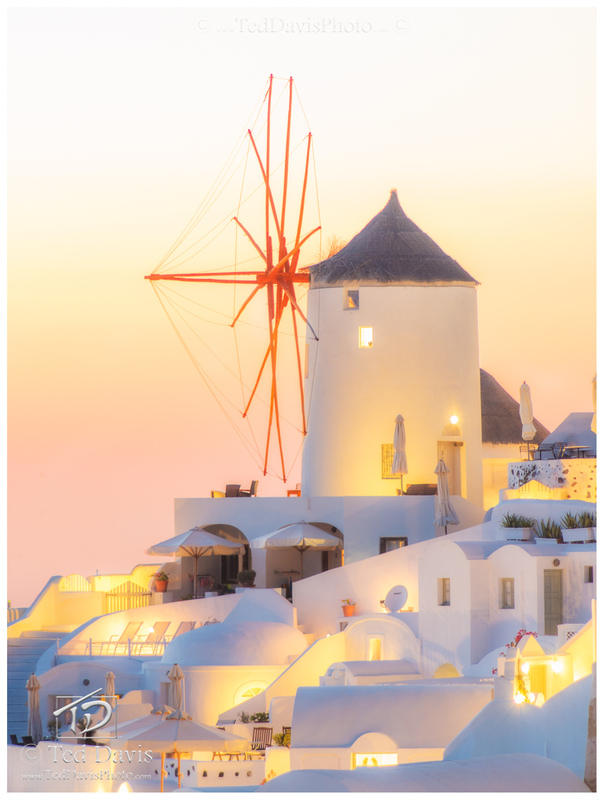 Now here I was, a professional photographer, framing the whimsical windmills of Oia in the softest, loveliest sunset light I could imagine. As the glow from the sunset mingled with the radiant light of the village, I captured an image I will forever remember; a reminder that absolutely anything is possible to those who dream. Photo © copyright by Ted Davis.